One of the biggest costs of constructing a log home is labor. 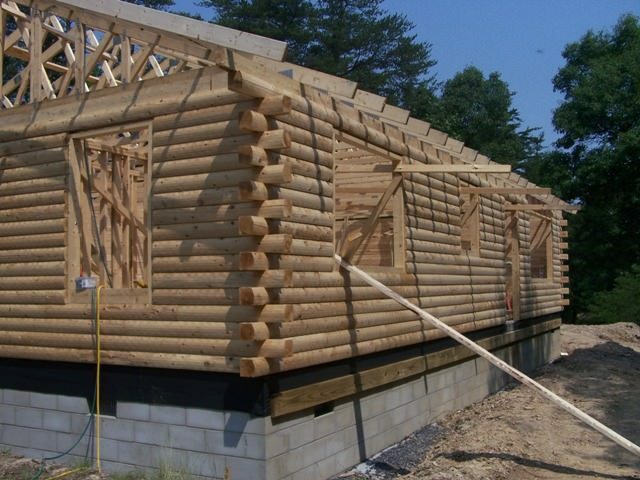 Many log home buyers fail to consider the advantages of reducing the amount of on-site work required for constructing a log home. We spoke with Katahdin dealer Jim Sickles of Iron City Log Homes in Jackson, Ohio, about the benefits and cost savings that a Katahdin Cedar Log Home kit offers. Jim has built log homes since he was 17 years old and seen most of the different types of manufactured log homes available. Katahdin offers several advantages to conventional log home building. Each log home milled at the Oakfield mill is linked to the computerized plans. 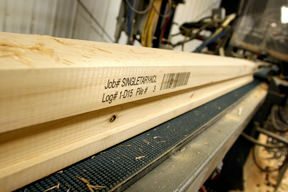 Each log is pre-cut, drilled and barcoded at the mill by using a custom state of the art manufacturing line. The advantage of having each piece cut to exact measurement based on the plans is considerable, according to Sickles. “Katahdin has a product that is faster to assemble.” He and his experienced crew of six can install the subfloor and raise the log walls for a 2,000 square foot log home in an average of 3-4 days. Compared with other log homes he’s constructed with milled log stock in random lengths arriving on a truck, the labor difference can be substantial. With the load of uncut and undrilled logs, his crew first has to complete an inventory of the logs and cut logs to the appropriate length. If the design incorporates lots of jigs or dovetail joints, the cutting needs to be more precise and will take more time. With an ordinary load of logs for a home, the time for sorting, cutting, drilling and actual building swells to 2-3 weeks, not including weather delays. Sickles says that his crew labor costs run between $6,000 and $7,000 per week. 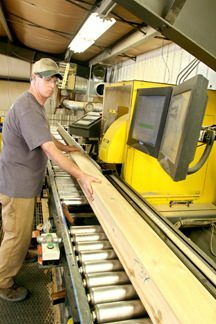 A quick bit of figuring and a Katahdin Cedar Log Home can save as much as $21,000 in labor just from the manufacturing process of cutting, drilling and barcoding completed at the mill. The barcoding also helps to avoid delays in construction. Sickles commented, “If I need to locate a particular log, I can call the Oakfield mill and get the exact location of a particular piece in the shrink-wrapped pallets.” Instead of resorting to a giant game of pick up sticks, the crew can locate the next essential piece and move on. Kathadin’s use of Northern White Cedar has construction benefits as well. Because cedar is less dense — and more efficient in insulation — the logs are considerable lighter to lift. With larger 8 inch logs of other wood species, jobs that would normally take a couple of men to lift a cedar log will require a crane for the same length of white or yellow pine. “Cedar is also lower maintenance as a log home material,” Sickles added. It’s easy to see that the manufacturing process for Katahdin Cedar Log Homes adds substantially to the value and cost savings when considering construction costs. Next month: We take a look at how Katahdin’s Energy Envelope System saves on plumbing, wiring and other finish costs, as well as long-term energy consumption.